If we were friends back when I was a kid and you came over to my house for a sleepover, you might’ve been a little shocked by how I decorated my bedroom. While most girls my age had bedrooms covered in New Kids on the Block posters and splatter-painted walls, mine looked like Christmas. It didn’t matter if it was June or January, when you walked in my room it was Christmas. I had at least half a dozen little Christmas trees all throughout my room, easily a hundred Santa Claus figurines, white twinkle lights everywhere and even an old wooden sled propped up in the corner. I said goodbye to Christmas decor all year round when I left my childhood home and went off to college, but every year as December approaches I’m as excited as a kid on Christmas morning to bust out the tree and plug in some twinkle lights! G doesn’t exactly share my enthusiasm and always makes me wait until after Thanksgiving, which I have interpreted to mean after Thanksgiving dinner (not the day) so I get to work almost as soon as the last bite of turkey leaves the fork. I love Christmas, and believe it is a magical time. I think it’s safe to say Lowe’s agrees with me. 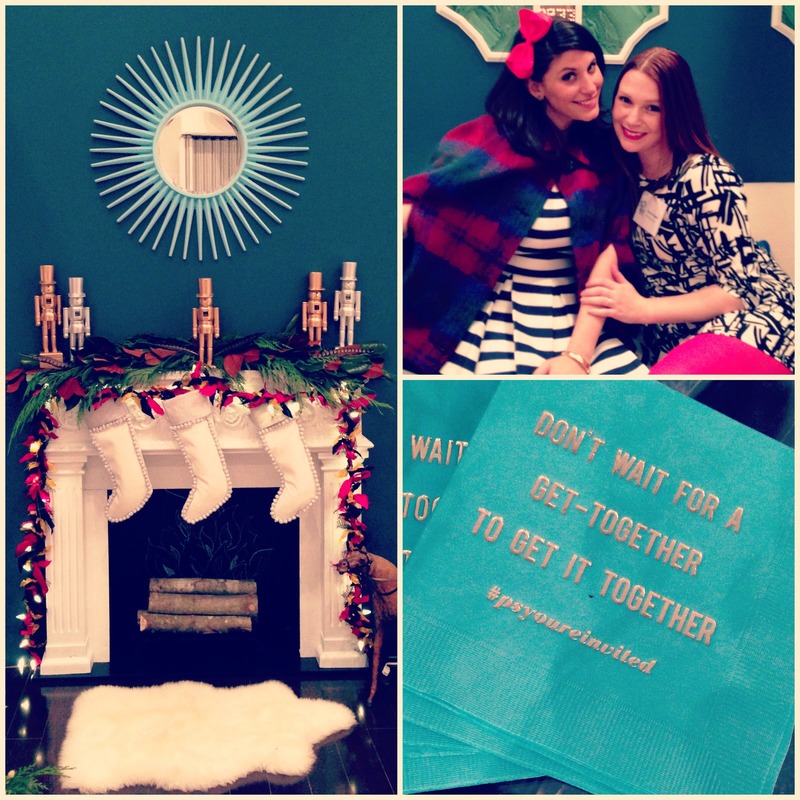 A few weeks ago I had the honor of being invited to New York City by Lowe’s Home Improvement for their “Deck the Halls and Walls and All” event. How did they know I was so crazy for Christmas?! And that I wouldn’t say no to a free trip to NYC?! 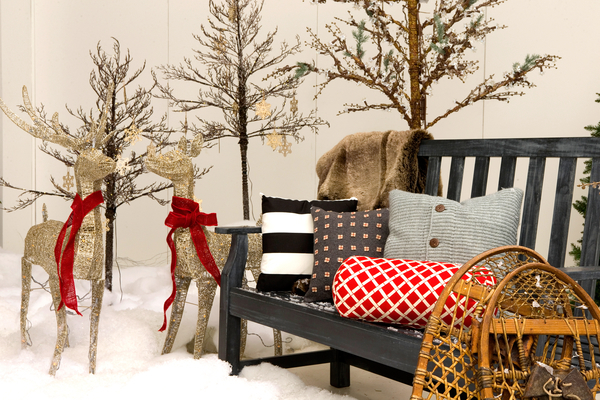 For this event, Lowe’s and seven guest designers built and decked out the ultimate holiday home in a New York City loft. 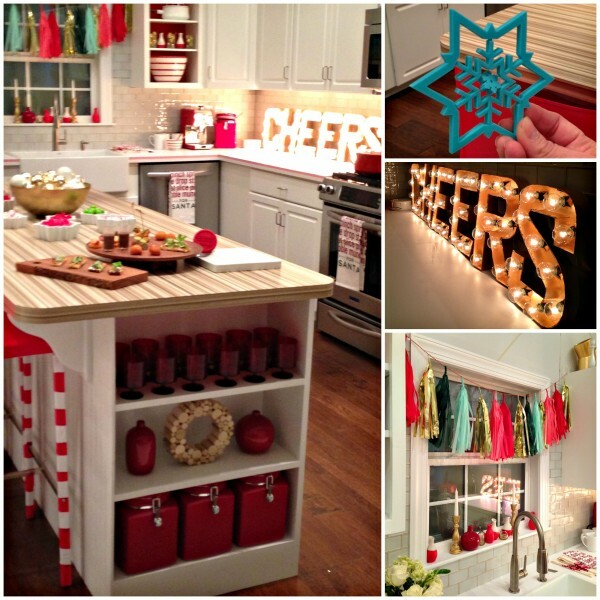 The event showcased loads of ideas and inspiration to get your home holiday ready, from simple home improvement projects to eye-catching and festive décor! In addition to drooling over these gorgeous spaces, I also had the opportunity to meet the designers, make some fabulous new blogging friends, rub elbows with Anthony Carrino and John Colaneri from HGTV’s Cousins Undercover, and join in a Wrap Off/Rap Off. (My team won. Duh.) The fun of the party certainly matched the festiveness of these beautiful rooms – check them out! An eye-catching entryway, designed by Gabrielle Blair from Design Mom. Photo courtesy of Lowe’s Home Improvement. Photo courtesy of Lowe’s Home Improvement. 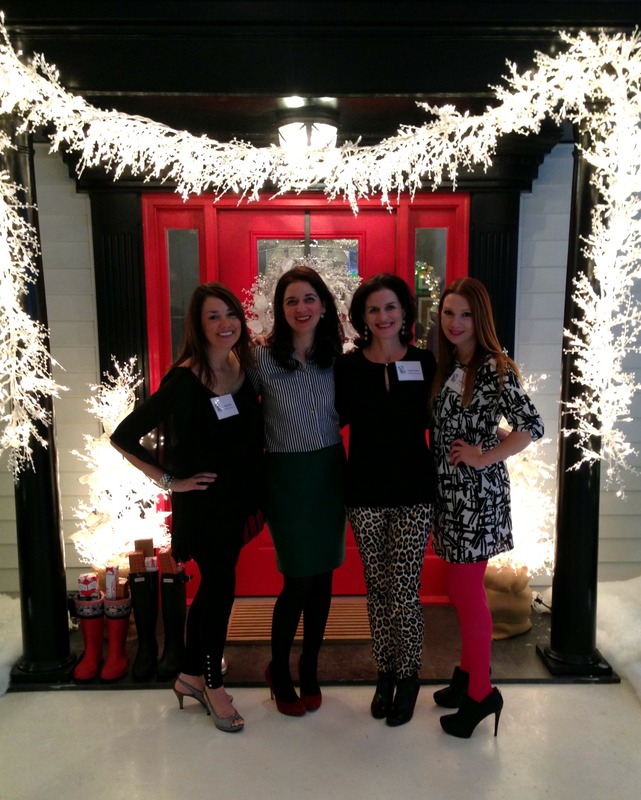 Traci from Cleverly Inspired, Gabrielle (the designer), Laura from Bright, Bold & Beautiful and yours truly standing in the entryway lit up at night. I’m in love with these girls and that white lighted garland from Lowe’s! A welcoming foyer, designed by Jenny Komenda from Little Green Notebook. Photo courtesy of Lowe’s Home Improvement. My new favorite designer: Brit Morin from Brit. 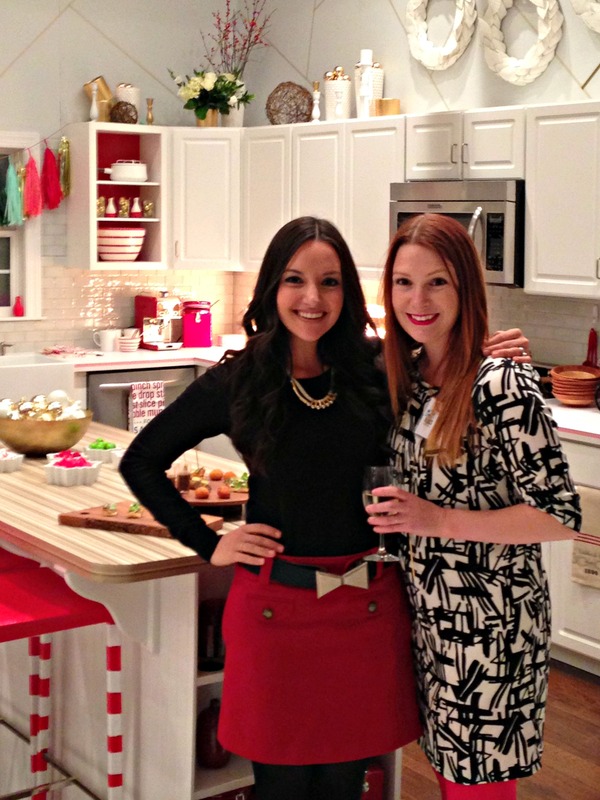 & Co, posing in front of the gorgeous Christmas kitchen she created! Photo courtesy of Lowe’s Home Improvement. Seriously. It was amazing. Look for my kitchen appearing as Brit’s kitchen, coming soon. Me and Brit. Oh, how I adore this girl! A cozy, Scandinavian cabin-inspired dining room by Brittni Mehlhoff & Gabriel Cabera from Curbly.com. Photo courtesy of Lowe’s Home Improvement. Yes, those are cronuts on the table. Try not to eat your screen. A bold and colorful living room by the bold and colorful Erica Domesek from P.S. I Made This. P.S. My tights matched this room. 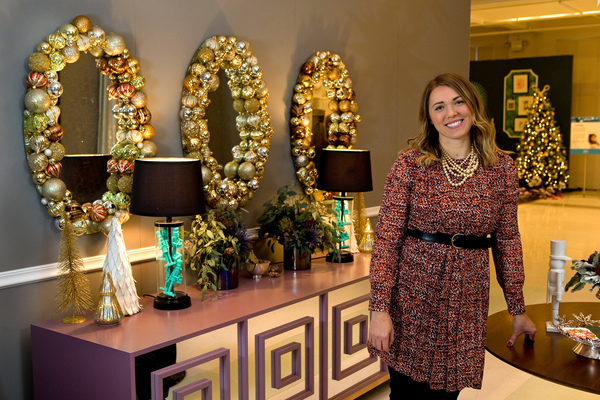 You’d be hard-pressed NOT to dream of sugarplums in this holiday-clad bedroom designed by Jordan Ferney from Oh Happy Day. Photo courtesy of Lowe’s Home Improvement. Don’t forget to show your bathroom some love this holiday season! Jordan Ferney from Oh Happy Day did just that. Photo courtesy of Lowe’s Home Improvement. A closer look at some of the gorgeous details! 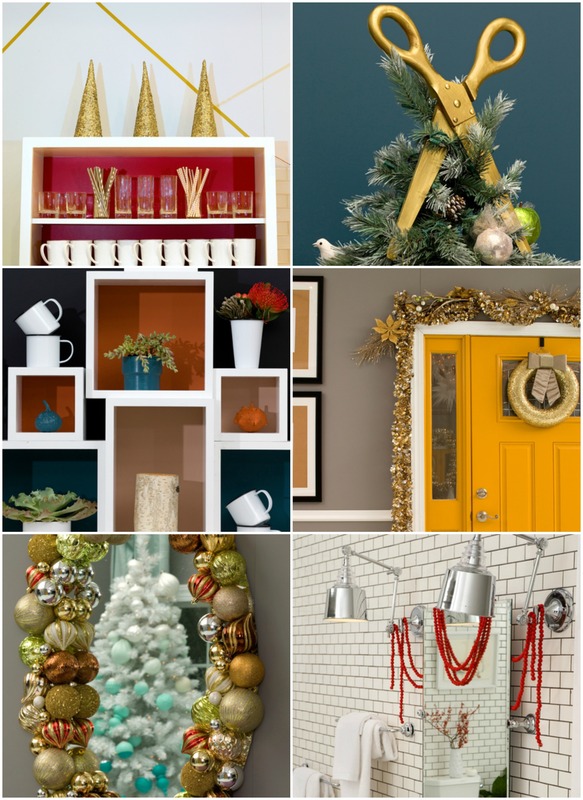 Images courtesy of Lowe’s Home Improvement. This is just a sampling from this fabulous event – check out my Instagram feed (allthingsgd) and search #holidayreadyhome for loads of behind-the-scenes scenes from that night! Last, but certainly not least – I’m sure you’re all wondering how you can get your hands on all of this gorgeousness you see here. Well, you’re in luck! Lowe’s has created a Look Book with loads of interactive images. Simple hover over a picture and information and links will appear to the Lowe’s products featured in these spaces. Now’s the time to get your shop on, so click away! A great big THANK YOU goes out to Lowe’s Home Improvement for including me in this most magical event. Happy Holidays everyone! Only 13 more days before I get to bust out our tree!